Please send me the information package. This includes the member's manual, detailed program descriptions of the programs of indicated interest, and an email follow up. The weekly soccer lessons are designed to maximize enjoyment for the participants and to improve physical abilities, build self-confidence, cultivate a foundation of good sportsmanship and the value of effort. Our goal is to produce confident, skilled soccer players who love the game of soccer and will reach their full potential. These lessons present a unique way for participants to build skill level by progressing the athletes through fundamental soccer skills in great detail each week. All athletes will receive progressive report cards. We are excited to have introduced our 5 Star development levels. Motivation, focus and understanding are all part of 5 criteria! The soccer program is designed for beginners, intermediate and advance kids. 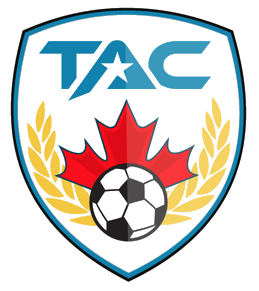 TAC’s coaches are Ontario Soccer Association certified and provide a great 1:4 coach/student ratio. The weekly basketball lessons are designed to maximize enjoyment for the participants and to improve physical abilities, build self-confidence, cultivate a foundation of good sportsmanship and the value of effort. Our goal is to produce confident, skilled basketball players who love the game of basketball and will reach their full potential. These lessons present a unique way for participants to build skill level by progressing the athletes through fundamental basketball skills in great detail each week. All athletes will receive progressive report cards. We are excited to have introduced our 5 Star development levels, which give students a measurable path to follow on the path. This has been proven to increase motivation, focus and understanding! The basketball program is designed for beginners, intermediate and advance students. The coaches at TAC Sports are Ontario Basketball Association certified and provide a great 1:4 coach/student ratio. Our TAC Tennis program is designed to focuses on fun games and drills for students from the beginner to advanced skill level. We focus on developing the fundamental techniques such as groundstrokes, volleys, overhead smash and serves. Advanced students focus on advanced techniques, strategy and the mental aspects of the game. The TAC Tennis school programs are designed to follow the programs LTAD (the Long Term Athlete Development Plan of Canada) and the OTA (Ontario Tennis Association). Appropriate court size and balls are used. *Our tennis programs are very adaptable. We use mini nets and bring all the equipment required. Tennis can be played in any size gym and on almost any hard surface. Our badminton programisdesignedfor maximum fun andprogressive skill development. TAC Sports badminton uses gradual progression of skills and hand eye co-ordination, skill levels and fun games and challenges to make a complete program for children aged 4-16. The main aspects of badminton are covered with more advanced techniques for already experienced players. Fun badminton skill building games are introduced leading up to rallies and then to full out matches and badminton tournaments within the class. This new exciting Martial Arts program is offered by Toronto Athletic Camps (TAC) for both boys and girls. The program has been developed by a seasoned Shotokan Karate instructor with eight years of experience teaching and fifteen years of practice. The Mixed Martial Arts program focuses on developing a healthy, strong and resilient body, placing much emphasis on cardiovascular endurance, muscle strength and conditioning. This engaging program also stresses discipline, respect and self-control. Coordination, balance, mental and muscle memory and cardiovascular health is improved, and the benefits obtained from this program are not only physical, but emotional and practical. All skill level and abilities are welcome. TAC Sports is the premier sports academy for skill, confidence and self-image development. Our exciting volleyball program is designed for students to learn and perfect their volleyball skills with the most fun. Our 5 Star step-by-step approach is designed to help students understand exactly what skills they need to learn while gaining the most confidence and increased self image. Our specialized Mixed Martial Arts program combines Jiu-Jitsu, Muay Tai and Shotokan Karate for the perfect mixture of martial arts. Students learn the basics from each of the martial arts and learn the principals of discipline, flexibility, and self-defense. Our 8 Week program is perfect for beginners to intermediate students. Co-Ed. The TAC Fitness and Health stream is designed for increasing body strength, fitness, and a confident self-image for participants and is developed by Toronto Athletic Camps Inc. There is a significant lack of attention to building a healthy lifestyle for youth and teens in the current school curriculum. Furthermore, Fitness and Health can and should be a priority for anyone regardless of age. Each Pillar is integral to developing long lasting Fitness and Health. OVERVIEW: Strong Food’s nutrition and cooking program teaches students the fundamentals of healthy cooking, introducing them to basic techniques, recipes and meal-plans to ensure that they are setting themselves up for a healthy and STRONG life! 8 Week – 10 Week program. Ages 7-12. Co-Ed. No prior cooking knowledge needed! RECIPES: Students learn about how to cook all the classic dishes, in a nutritious and healthy way. Some of the recipes include salad prep, alternative pastas, soups, healthy sandwiches, quinoa, sourdough bread sandwiches, yoghurt desserts, cookies, and stews. COOKING SHOW: Students receive nutrition cards and even get to be in their own cooking show by the end of the program. INSTRUCTORS: All of our programs are taught by instructors with nutrition, food industry and cooking knowledge. All instructors have First Aid & CPR and Vulnerable Sector screening. SAFETY: Safety is our #1 priority. Most classes use induction cook-tops. No sharp utensils are used in preparation. The Strong Food program is the perfect opportunity for young minds to practice valuable cooking skills and develop a healthy-eating mindset for life! How is TAC Sports different from an ordinary sports academy? Our mission is to have our students achieve their maximum confidence, leadership and skill potential in the fastest way possible and with the most fun. Our prices are very reasonable for our in-program selections. Please fill out the interest form to receive a full pricing package.